So the results of the French presidential elections are in and, as predicted, Emmanuel Macron, the pro-business anti-working class candidate, won with 66.1% of the vote. The fascist Marine Le Pen gained 33.9% of the vote, the biggest vote for a fascist in Europe since the Second World War. These elections have been extensively covered by the media. Here on Dream Deferred we have run a number of articles on the fascist FN and the issues around its rise. These include an analysis of the FN as a fascist party – what you need to know and our presidential election liveblog. However, the cultural war challenging Marine Le Pen and the FN is all too often ignored. This post looks at a few of the artists, musicians and writers who have challenged Le Pen and the fascists. I have picked just a few of my favourite French artists and musicians who are critiquing the conditions that enable the FN to flourish and are using their art to challenge Le Pen and fascism. France has a vibrant political hip-hop scene. One of the key figures in the movement is Médine. Médine Zaouiche (born 24 February 1983 in Le Havre) is better known by his stage name Médine. He is of French-Algerian descent and is a practicing Muslim. 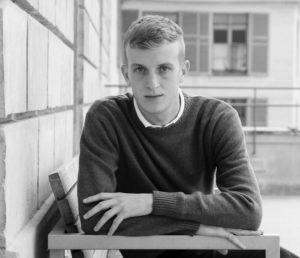 He grew up on the Quartier Mont-Gaillard, a 1970s housing project classified by the French government as a ZUS, or “sensitive urban zone” – areas characterised by their high percentage of social housing and high levels of unemployment. He has been a part of the hip-hop collective La Boussole since 1996 and describes himself as a “rapper with a conscience”. The music and rhymes are uncompromising – imagine Public Enemy meets Lowkey. He raps about poverty, Islamophobia, racism and police violence. In his videos and lyrics he promotes the ideas of Malcolm X and Martin Luther King. He despises Marine Le Pen whose job, he says, it is to “notice disquiet in French society and find scapegoats for those problems – the scapegoats could be Arabs or Blacks – and focus attention on those members of society”. Le Pen both makes a guest appearances in the video of the track, ‘Reboot’. Other prominant “conscience” French hip-hop artists include Kery James, Faada Freddy, Youssoupha, Axiom and Oxmo Puccino. C215, Christian Guémy, is a Parisian based street artist famous for his stencils. He concentrates on painting portraits, drawing attention to the poor, migrants and those marginalised in society. In one interview he stated: “In the end, behind the portraits, the question is always freedom and dignity in the face of a capitalist daily life system.” He believes that “urban art” is simply the sharing of artwork with others against gentrifications and conformity. 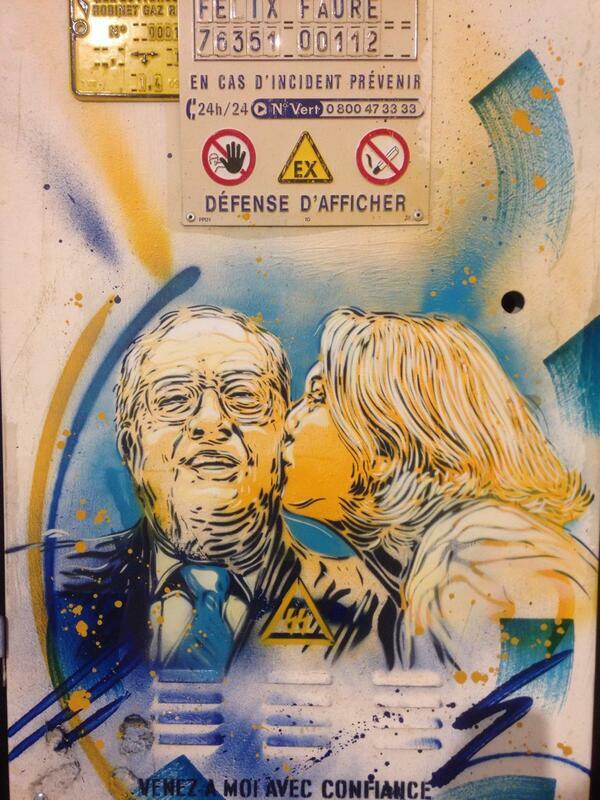 The stencil above shows the Jean-Marie Le Pen (the founder of the FN) kissing his daughter Marine Le Pen. 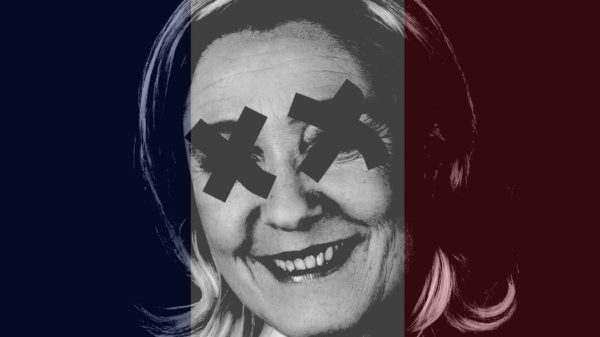 The message is simple and very effective – Marine Le Pen is just like her father – a fascist. C215’s work can be found in London. If you are interested in street art the French Muslim artist, Combo the Culture Kidnapper, has also produced work challenging racism and intolerance. This autobiographical novel is about a young boy growing up amid poverty in Hallencourt, a village in northern France. Hallencourt is a de-industrialised nightmare, the region’s mines and factories have all but closed down and jobs are scarce. Alcoholism is rampant and violence omnipresent. The village overwhelmingly votes for Marine Le Pen and the FN. The adolescent Eddy is trying to navigate his way through life, both trying to come to terms with his sexuality and the horrific bullying he encounters. The racism, homophobia, violence and naked cruelty of his parents, neighbours and school friends is presented in stark and unflinching terms. But they are also shown as victims and not just perpetrators. If you want to try and understand the conditions that allow the FN to thrive this novel is essential reading.